So what is in this pack? Well, stuff for outdoor living. 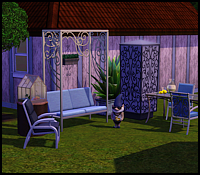 So you get one new chair, one new table, a few plants and some outdoor cooking stuff. 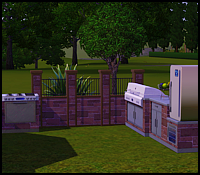 Basically one barbecue, one fridge and one cooker. Yes, ONE of each. It does come with a few new lamps and a few new decoration items. And a few hottubs. But it is very, very lean. That also means I am running out of things to say about it. I guess it is a nice pack if you are fussy about your garden. Or if you really really like hottubs. But wait until this goes on sale for half the price. Because seriously, it is overpriced.